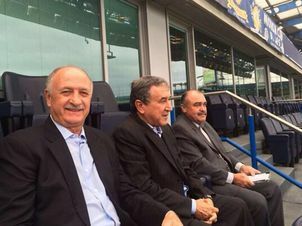 One month before the announcement of the list of players who will be called to the National Team for the World Cup, Luiz Felipe Scolari, known as Felipão, was in London on Saturday watching the Brazilian players help Chelsea beat Stoke by 3×0, at Stamford Bridge. Accompanied by coach coordinator, Carlos Alberto Parreira and the assistant coach Flavio Murtosa. They have been in Europe since last week watching the Champions League quarter finals. In Brazil, the impasse on who will pay the temporary work in Itaquerão continues. Andres Sanchez said Corinthians will pay: backstage at FIFA fe believe it will and are preparing themselves to dig deep in their pockets and leak their frustration; the Corinthians President jokes with journalists as if he knew nothing about it. And the area where a worker died last week is still interdicted.